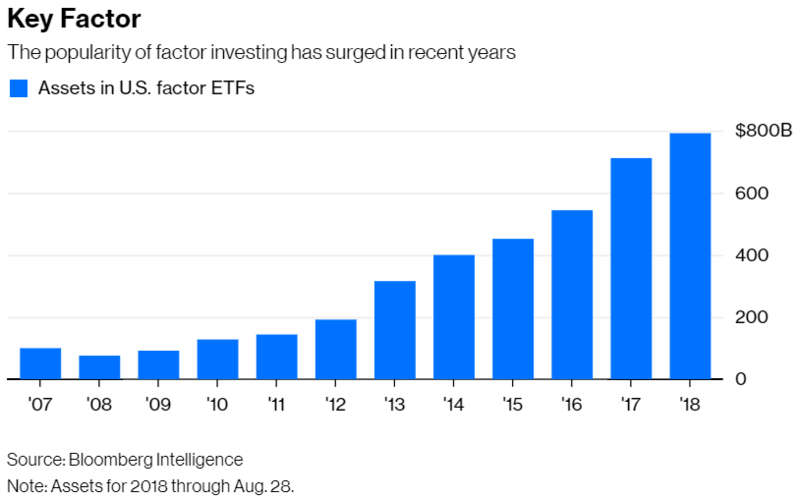 One appealing attribute of factor funds is that they allow investors to spread their bets easily among different investing styles, reducing the risk of an errant bet. Value investing, for example, has been a loser for more than a decade. 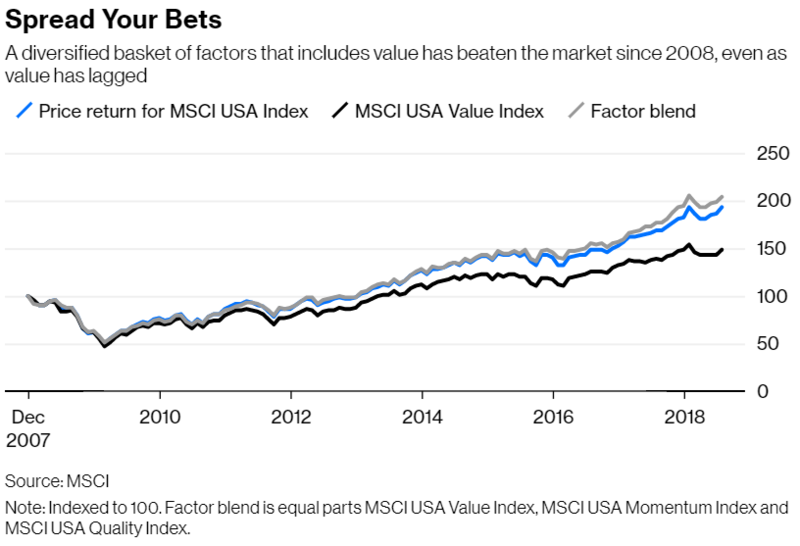 The MSCI USA Value Index has lagged the broad market MSCI USA Index by 2.6 percentage points annually since 2008 through July. 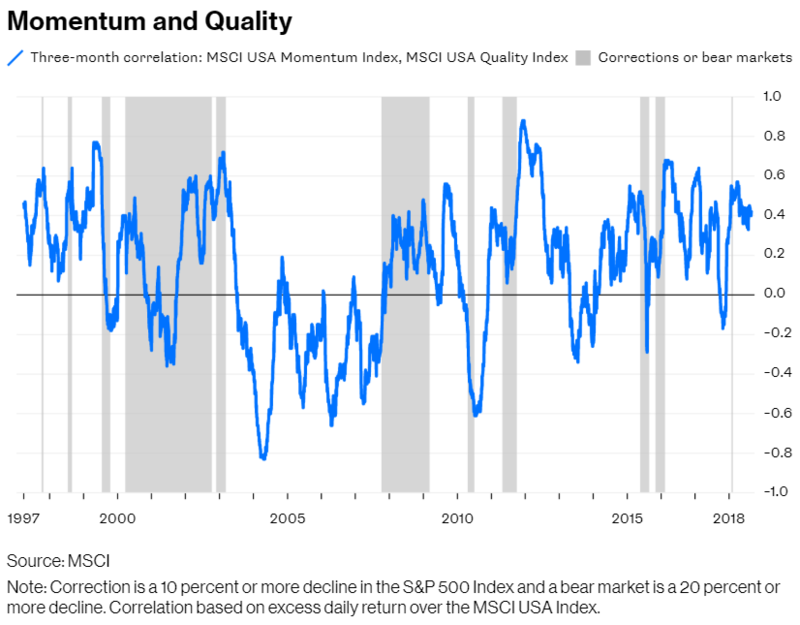 But an equal combination of the value index with the MSCI USA Momentum Index and the MSCI USA Quality Index has beaten the broad market by 0.6 percentage points a year. It’s not just value and momentum. The correlation between the value and quality indexes was a negative 0.54 over the same period. And the correlation between momentum and quality was 0.19, which implies that the two don’t move in lockstep. Over short periods, however, those correlations were highly unstable. The three-month correlation between value and momentum has been as high as 0.65 and as low as negative 0.93 since 1997. The highs and lows between value and quality were 0.43 and negative 0.92, and between momentum and quality they were 0.88 and negative 0.83. And they were just as unpredictable during downturns. The factors charted different paths around the 2008 financial crisis. 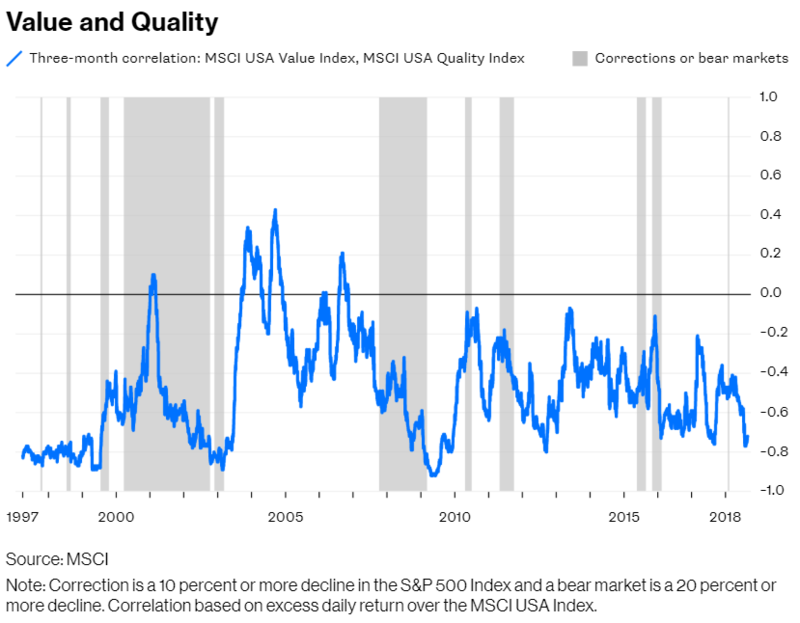 The value index lagged the broad market by 4.6 percentage points from Oct. 9, 2007, to March 9, 2009, while the momentum and quality indexes outpaced the market by 1 percentage point and 10.7 percentage points, respectively. On the other hand, they performed nearly identically during the dot-com crash. The value, momentum and quality indexes outpaced the broad market by 8.1 percentage points, 7.4 percentage points and 8.5 percentage points, respectively, from March 24, 2000, to Oct. 9, 2002. Their correlations were similarly chaotic across the nine corrections since 1997. So it’s not necessarily true that factors uniformly disappoint during downturns. Nor is it true that rising factor correlations have augured market stress. 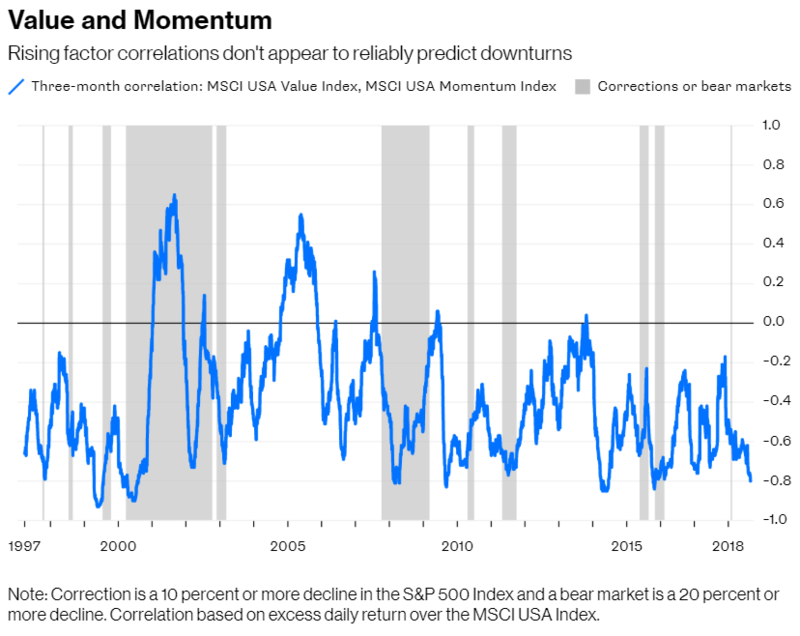 Yes, the correlation between value and momentum rose in the run-up to the financial crisis and some of the corrections since 1997, but it declined as the dot-com crash approached and just before a handful of corrections. It also spiked numerous times during the bull runs, flashing a false positive. The same is true for the correlations between value and quality, and momentum and quality. Even if rising factor correlations were problematic, it’s not clear that they’re elevated now. The correlation between value and momentum has been a negative 0.8 over the last three months, well below the long-term correlation. The correlation between value and quality has been a negative 0.72, which is also lower than usual. Only the correlation between momentum and quality of 0.42 appears to be somewhat elevated. It’s tempting to believe that markets harbor hints of impending downturns. But investors who hoped to find a crystal ball in factor correlations will have to look elsewhere.